The latest shiny object to grab the buzz of the online marketers and social media set is something called Empire Avenue. As you know, I like to jump into many new things to stir around and see if I can find practical value to share with my readers and I usually don’t write about something unless I feel it does merit you taking a look at. Having said that, Empire Avenue is something that is primarily for those that already have a decent amount of involvement in social media. If you’re just getting started, this isn’t the place to focus. First off, what is it. On the surface it’s a stock market like game where individuals and companies offer shares of stock for sale and that stock value is measured based on demand, actions taken on Empire Avenue and the collective participation and engagement in social media sites such as Twitter, Facebook, LinkedIn and YouTube. 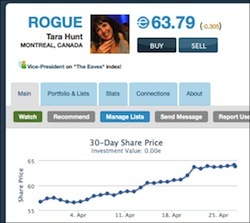 Players try to increase the value of their profile and also invest in other individuals to earn a return on their virtual dollars, or eaves as they are called, in the game. There are countless ways to increase your value and participate in the game so I won’t even attempt to cover that for now. Critics of the recent hype suggest this is little more than an ego boosting toy for social media gurus and wanna be gurus and on the surface you can certainly see why this claim is pretty easy to level. However, as I’ve toyed with it for less than a week now I’ve found something valuable enough for me to suggest that those heavily engaged in social media and other online pursuits take a look at it and here’s why. Of all the tools out there that are trying to measure influence and engagement, tools like Klout and Peer Index, I think Empire Avenue may have developed one of the best for doing so. It doesn’t seem to be all about pure follower numbers as it weighs comments and other activity as well. So, from that standpoint there exists some value. The other thing I’ve noticed since playing with it is that it does a very good job of helping me focus on the important aspects of my social media engagement outside of Empire Avenue. Because the game measures the important things I do on Twitter and Facebook, for example, and rewards me in the game for doing them, it has the impact of making active social media participation more fun. Now, that may not be enough for some to trudge through learning another interface, but I think it’s reason enough to recommend you put it on your radar of things to look at while it’s still in the early stages.